Goodreads Summary: What happens when you fall in love with someone everyone seems determined to fear? Ninety seconds can change a life — not just daily routine, but who you are as a person. Gretchen Asher knows this, because that’s how long a stranger held her body to the ground. When a car sped toward them and Gretchen’s attacker told her to run, she recognized a surprising terror in his eyes. And now she doesn’t even recognize herself. Ninety seconds can change a life — not just the place you live, but the person others think you are. Phoenix Flores-Flores knows this, because months after setting off toward the U.S. / Mexico border in search of safety for his brother, he finally walked out of detention. But Phoenix didn’t just trade a perilous barrio in El Salvador for a leafy suburb in Atlanta. He became that person — the one his new neighbors crossed the street to avoid. Ninety seconds can change a life — so how will the ninety seconds of Gretchen and Phoenix’s first encounter change theirs? 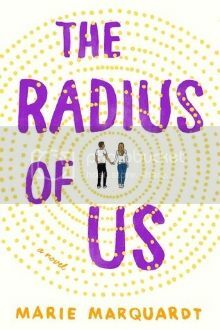 Told in alternating first person points of view, The Radius of Us is a story of love, sacrifice, and the journey from victim to survivor. It offers an intimate glimpse into the causes and devastating impact of Latino gang violence, both in the U.S. and in Central America, and explores the risks that victims take when they try to start over. 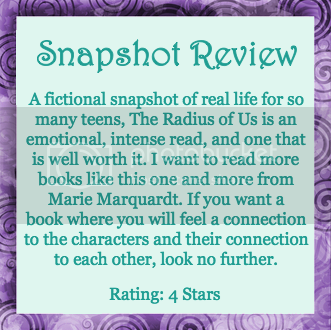 Most importantly, Marie Marquardt's The Radius of Us shows how people struggling to overcome trauma can find healing in love. First Thought After Finishing: This book tackles a lot of issues, but it does so with sensitivity and reason and as part of the overall story. Gretchen is recovering from the ninety seconds that changed her life and destroyed the illusion of safety. She rarely goes out other than to babysit for her cousins. One day, she thinks she sees her attacker again, only it's not him. It's Phoenix, an asylum seeker from El Salvador. He knows better than to get involved with Gretchen--or anyone--he needs to free and care for his brother and figure out the future. Only the universe has other plans for them. As the radius between them shrinks, both realize that secrets can only stay hidden for so long, and in order to move forward, they have to confront their past. I thought the premise of this book sounded interesting, but I did not expect to love it as much as I did. Gretchen and Phoenix both have their own backgrounds and experiences. Phoenix's story in particular broke my heart, especially when considering for how many people that life must be a reality. Phoenix had incredible strength and integrity, and I just wanted to reach through the pages and give him a hug. He wasn't always perfect, but he is definitely a good guy who deserved some good in his life. Then there is Gretchen. I enjoyed reading her journey of coming back to life. What I loved most is that although Phoenix helped her and gave her incentive to take back control, she did not drastically change just because of a boy. 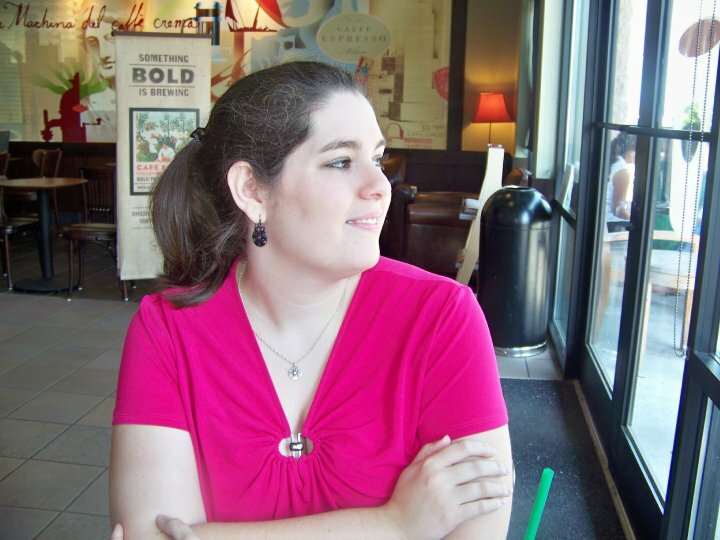 She had good friends, a supportive family, and she was willing to accept help. She was adrift just as much as Phoenix, and that is what made them work so well together. "When he's with me, we are both here. Right here." Beyond the couple, I loved the dual POVs in this book as well as the occasional flashbacks. There were moments of fun and general kindness in the midst of all the heavy issues, and those moments also carried emotional power. If I had one complaint, it would only be the ending, because I wanted to see ore from the characters. Still, although their tumultuous journeys found some resolutions, I find myself thinking about Gretchen and Phoenix and hoping that they would have happiness in their fictional future. Most Memorable Aspect: Gretchen and Phoenix were so perfectly matched. Circumstances brought them together, but they make sense as a couple. I loved that they needed each other and that their relationship had balance.